Grand Hymns of the Faith is a masterfully arranged collection for advanced pianists intended for use in the worship service, for special occasions and for one's own personal enjoyment and worship experience. In the words of the arranger, "sacred music...is often the outward response of a heart filled with gratitude for what God has done." These beautiful hymn arrangements are an inspiring expression of that gratitude. 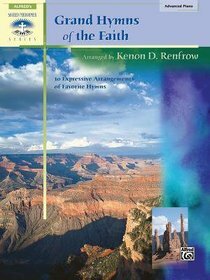 About "Grand Hymns of the Faith (Music Book)"